Calder was the most acclaimed and influential sculptor of his time. Born in a family of celebrated, though more classically trained artists, Calder utilized his innovative genius to profoundly change the course of modern art. He began by developing a new method of sculpting: by bending and twisting wire, he essentially “drew” three-dimensional figures in space. He is renowned for the invention of the mobile, whose suspended, abstract elements move and balance in changing harmony. Calder also devoted himself to making. Alexander Calder was born in 1898, the second child of artist parents– his father was a sculptor and his mother a painter. Because his father Alexander Stirling Calder received public commissions, the family traversed the country throughout Calder’s childhood. Calder was encouraged to create, and from the age of eight he always had his own workshop wherever* the family lived. For Christmas in 1909, Calder presented his parents with two of his first sculptures, a tiny dog and duck cut from a brass sheet and bent into formation. The duck is kinetic– it rocks back and forth when tapped. Even at age eleven, his facility in handling materials was apparent. Despite his talents, Calder did not originally set out to become an artist. He instead enrolled at the Stevens Institute of Technology after high school and graduated in 1919 with an engineering degree. Calder worked for several years after graduation at various jobs, including as hydraulics engineer and automotive engineer, timekeeper in a logging camp, and fireman in a ship’s boiler room. While serving in the latter occupation, on a ship from New York bound for San Francisco, Calder awoke on the deck to see both a brilliant sunrise and a scintillating full moon; each was visible on opposite horizons (the ship then lay off the Guatemalan coast). The experience made a lasting impression on Calder: he would refer to it throughout his life. Calder committed to becoming an artist shortly thereafter, and in 1923 he moved to New York and enrolled at the Art Students’ League. He also took a job illustrating for the National Police Gazette, which sent him to the Ringling Brothers and Barnum & Bailey Circus to sketch circus scenes for two weeks in 1925. The circus became a lifelong interest of Calder’s, and after moving to Paris in 1926, he created his Cirque Calder, a complex and unique body of art. The assemblage included diminutive performers, animals, and props he had observed at the Ringling Brothers Circus. Fashioned from wire, leather, cloth, and other found materials, Cirque Calder was designed to be manipulated manually by Calder. Every piece was small enough to be packed into a large trunk, enabling the artist to carry it with him and hold performances anywhere. Its first performance was held in Paris for an audience of friends and peers, and soon Calder was presenting the circus in both Paris and New York to much success. Calder’s renderings of his circus often lasted about two hours and were quite elaborate. Indeed, the Cirque Calder predated performance art by forty years. Calder found he enjoyed working with wire for his circus: he soon began to sculpt from this material portraits of his friends and public figures of the day. Word traveled about the inventive artist, and in 1928 Calder was given his first solo gallery show at the Weyhe Gallery in New York. The show at Weyhe was soon followed by others in New York, as well as in Paris and Berlin: as a result, Calder spent much time crossing the ocean by boat. He met Louisa James (a grandniece of writer Henry James) on one of these steamer journeys and the two were married in January 1931. He also became friendly with many prominent artists and intellectuals of the early twentieth century at this time, including Joan Miró, Fernand Léger, James Johnson Sweeney, and Marcel Duchamp. In October 1930 Calder visited the studio of Piet Mondrian in Paris and was deeply impressed by a wall of colored, paper rectangles that Mondrian continually repositioned for compositional experiments. He recalled later in life that this experience “shocked” him toward total abstraction. For three weeks following this visit, he created solely abstract paintings, only to discover that he did indeed prefer sculpture to painting. Soon after, he was invited to join Abstraction-Création, an influential group of artists (including Arp, Mondrian, and Hélion) with whom he had become friendly. In 1933, Calder and Louisa left France and returned to the United States, where they purchased an old farmhouse in Roxbury, Connecticut. Calder converted an icehouse attached to the main house into a studio for himself. Their first daughter, Sandra, was born in 1935, and a second daughter, Mary, followed in 1939. He also began his association with the Pierre Matisse Gallery in New York with his first show there in 1934. James Johnson Sweeney, who had become a close friend, wrote the catalogue’s preface. Calder also constructed sets for ballets by both Martha Graham and Eric Satie during the 1930s, and continued to give Cirque Calder performances. Calder’s earliest attempts at large, outdoor sculptures were also constructed in this decade. These predecessors of his later imposing public works were much smaller and more delicate; the first attempts made for his garden were easily bent in strong winds. Yet, they are indicative of his early intentions to work on a grand scale. In 1937, Calder created his first large bolted stabile fashioned entirely from sheet metal, which he entitled Devilfish. Enlarged from an earlier and smaller stabile, the work was exhibited in a Pierre Matisse Gallery show, Stabiles and Mobiles. This show also included Big Bird, another large work based on a smaller maquette. Soon after, Calder received commissions to make both Mercury Fountain for the Spanish Pavilion at the Parisian World Fair (a work that symbolized Spanish Republican resistance to fascism) and Lobster Trap and Fish Tail, a sizable mobile installed in the main stairwell of the Museum of Modern Art in New York. When the United States entered World War II Calder applied for entry to the Marine Corps but was ultimately rejected. He continued to create: because metal was in short supply during the war years, Calder turned increasingly to wood as a sculptural medium. Working in wood resulted in yet another original form of sculpture, works called “constellations” by Sweeney and Duchamp. With their carved wood elements anchored by wire, the constellations were so called because they suggested the cosmos, though Calder did not intend that they represent anything in particular. The Pierre Matisse Gallery held an exhibition of these works in the spring of 1943, Calder’s last solo show at that gallery. His association with Matisse ended shortly thereafter and he took up the Buchholz Gallery/Curt Valentin as his New York representation. The forties and fifties were a remarkably productive period for Calder, which was launched in 1939 with the first retrospective of his work at the George Walter Vincent Smith Gallery in Springfield, Massachusetts. A second, major retrospective was exhibited at the Museum of Modern Art in New York just a few years later, in 1943. In 1945, Calder made a series of small-scale works; in keeping with his economy, many were made from scraps of metal trimmed while making larger pieces. While visiting Calder’s studio about this time, Marcel Duchamp was intrigued by these small works. Inspired by the idea that the works could be easily dismantled, mailed to Europe, and re-assembled for an exhibition, he planned a Calder show at Galerie Louis Carré in Paris. This important show was held the following year and Jean-Paul Sartre wrote his famous essay on Calder’s mobiles for the exhibition catalogue. In 1949, Calder constructed his largest mobile to date, International Mobile, for the Philadelphia Museum of Art’s Third International Exhibition of Sculpture. He designed sets for Happy as Larry, a play directed by Burgess Meredith, and for Nuclea, a dance performance directed by Jean Vilar. Galerie Maeght in Paris also held a Calder show in 1950, and subsequently became Calder’s exclusive Parisian dealer. His association with Galerie Maeght lasted twenty-six years, until his death in 1976. After his New York dealer Curt Valentin died unexpectedly in 1954, Calder selected the Perls Gallery in New York as his new American dealer, and this alliance also lasted until the end of his life. Calder concentrated his efforts primarily on large-scale commissioned works in his later years. Some of these major monumental sculpture commissions include: .125, a mobile for the New York Port Authority that was hung in Idlewild (now John F. Kennedy) Airport (1957); La Spirale, for UNESCO, in Paris (1958); Teodelapio, for the city of Spoleto, Italy (1962); Man, for the Expo in Montreal (1967); El Sol Rojo (the largest of all Calder’s works, at sixty-seven feet high) installed outside the Aztec Stadium for the Olympic Games in Mexico City; La Grande Vitesse, the first public art work to be funded by the National Endowment for the Arts (NEA) for the city of Grand Rapids, Michigan (1969); and Flamingo, a stabile for the General Services Administration in Chicago (1973). As the range and breadth of his various projects and commissions indicate, Calder’s artistic talents were renowned worldwide by the 1960s. A retrospective of his work opened at the Guggenheim Museum in New York in 1964. Five years later the Fondation Maeght, in Saint-Paul-de-Vence, France, held its own Calder retrospective. In 1966, Calder, together with his son-in-law Jean Davidson, published a well-received autobiography. Additionally, both of Calder’s dealers, Galerie Maeght in Paris and the Perls Gallery in New York averaged about one Calder show each per year. In 1976, he attended the opening of yet another retrospective of his work, Calder’s Universe, at the Whitney Museum of American Art in New York. Just a few weeks later, Calder died at the age of seventy-eight, ending the most prolific and innovative artistic career of the twentieth century. 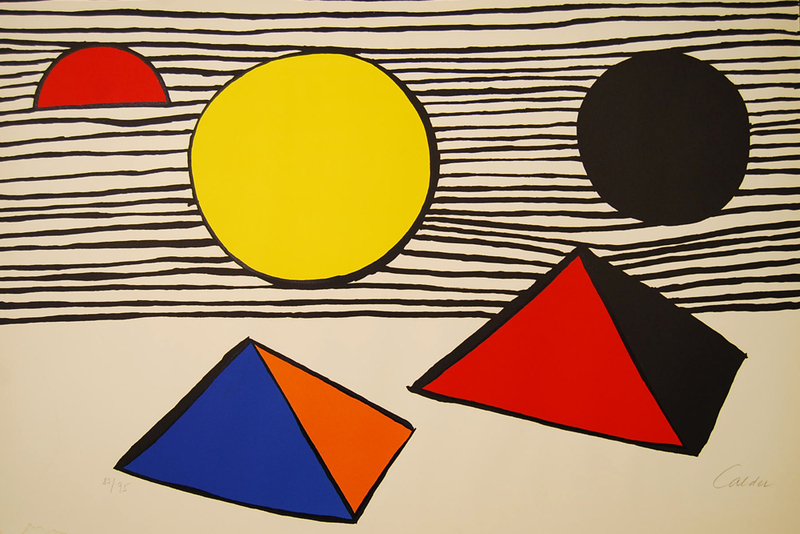 Born in Pennsylvania in 1898, Alexander Calder created works of art throughout his childhood. After graduating from the Stevens Institute of Technology and briefly considering an engineering career, Calder became a professional artist in his early twenties. He moved to New York and attended classes at the Art Students League while working concurrently as an illustrator for the National Police Gazette. A series of the Ringling Brothers and Barnum & Bailey Circus was included amongst these illustrations. Soon after moving to Paris in 1926, Calder developed his Cirque Calder, a miniature work of performance art made of wire and found materials. Performances of the Cirque Calder gained Calder introduction to artists in Paris, then the center of the art world. He also invented wire sculpture whereby Calder “drew” in space with wire portraits of friends and personalities of the day. In 1928, he was given his first solo exhibition of these wire sculptures at the Weyhe Gallery in New York. Calder made his first wholly abstract works during these crucial years of artistic development. He invented the kinetic sculpture now known as the “mobile.” Coined by Marcel Duchamp, the word refers to both “motion” and “motive” in French. The earliest mobiles moved by a system of cranks and motors, although these mechanics were virtually abandoned as Calder fully developed mobiles that moved freely with the air’s currents. He also created stationary abstract works made of intersecting planes of shapes, which Jean Arp (playing off Duchamp’s term) referred to as “stabiles.” The first of Calder’s outdoor works–predecessors of his later monumental sculpture–were fabricated during this era as well. Calder’s travels were curtailed by the onslaught of the second World War, yet he remained active throughout its duration. Calder completed Devilfish, his first stabile enlarged from a small model, in 1937. Soon afterwards, he received two important commissions: Mercury Fountain for the Spanish Pavilion at the 1937 Paris World Fair (a work that symbolized Spanish Republican resistance to fascism), and the mobile Lobster Trap and Fish Tail, 1939, which was installed in the main stairwell of the new Museum of Modern Art building in New York. Calder made a series of “constellations;” that is, constructions of delicately carved wood elements affixed to inflexible wires. The George Walter Vincent Smith Gallery of Springfield, Massachusetts held the first retrospective of his work in 1938. Another retrospective followed in 1943 at the Museum of Modern Art, New York. At the time, Calder was the youngest artist ever to whom the Museum had dedicated a full-career survey. Eager to exhibit again in Europe after the end of World War II, Calder held a major show of his work at Galerie Louis Carré, Paris in 1946. Jean-Paul Sartre wrote a seminal essay on Calder’s work for the exhibition catalogue. In 1948, Calder spent several inspirational weeks in Brazil where he created many works and held two highly successful exhibitions in Rio de Janeiro and São Paulo. International Mobile, made in 1949 for the Philadelphia Museum of Art’s Third International Exhibition of Sculpture, was Calder’s largest mobile to date, at approximately twenty feet high. He designed sets and costumes for a number of theatrical performances. Another important commission was the Aula Magna, a huge acoustic ceiling he designed for the auditorium at Universidad Central de Venezuela. Calder devoted much of his later working years to commissions he received for public, monumental works. Some of his most important projects include: .125, a mobile hung in John F. Kennedy Airport, New York (forty-five feet high; Teodelapio, for the town of Spoleto, Italy (fifty-eight feet high); Man, for the 1967 exposition in Montreal (sixty-five feet high); El Sol Rojo, for the 1968 Mexico City Olympic Games (eighty feet high); and the first public art work funded by the National Endowment for the Arts, La Grande Vitesse, for Grand Rapids, Michigan (forty-three feet high). He also designed and painted two jets for Braniff Airlines. His two dealers, Galerie Maeght in Paris and Perls Gallery in New York, averaged about one Calder show each per year. Major retrospectives of Calder’s work were held at the Guggenheim Museum in New York (1964), Museum of Fine Arts, Houston (1964), Musée National d’Art Moderne, Paris (1965), the Fondation Maeght in Saint-Paul-de-Vence, France (1969), and the Whitney Museum of American Art, New York (1976). Calder died in New York in 1976, at the age of seventy-eight.